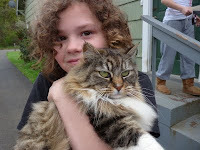 My daughter Emma (10 years old) saw my blog and wanted to read the Melina poem. I read it aloud to her, and she said, "That's not a very good poem." She then asked me to write one for her (assuming, I guess, that she would make an inspiring topic). So here's my one-bad-poem from a couple days ago. with seventy-nine other intrepid souls. it pulls her hair into ringlets. Carolynne, thank you so much -- you are a gem!